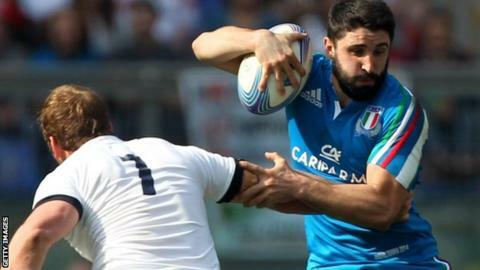 Harlequins have signed Italy international Tito Tebaldi from Ospreys on a deal until the end of the season. The 27-year-old scrum-half, who has won 20 international caps, has featured 19 times for the Pro12 side since joining from Zebre in summer 2013. Tebaldi replaces Sam Stuart in the Quins squad after the 23-year-old left the Stoop for personal reasons. Quins boss Conor O'Shea said: "In the circumstances we are delighted to welcome a player of Tito's experience." He added: "We hope we can provide the right impetus for him to re-launch his career through Harlequins." Tebaldi has made just one appearance for Ospreys this season, coming on as a replacement in the LV= Cup defeat by Saracens last month. "I am grateful to have been given this opportunity," said the Parma-born player. "I'm looking forward to moving to London and continuing my career there."